Anche in #Brasile i cittadini hanno mandato a casa la sinistra! It may not just be shared politics that will forge a strong relationship with the two right-wing politicians, but heritage as President-elect Bolsonaro is of Italian background. The Brazilian’s grandfather hailed from Anguillara Veneta, in Padua, northern Italy, while his maternal grandparents came from Lucca in Tuscany. 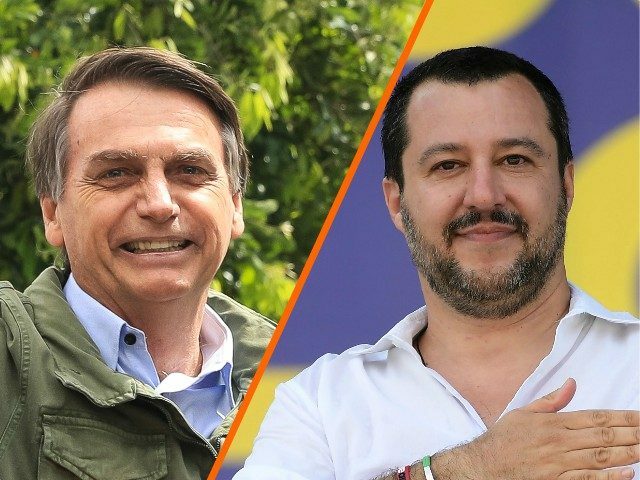 Locals of Bolsonaro’s Tuscan homeland are fans of Matteo Salvini, AFP reports, and the region’s president Luca Zaia dubbed the area’s famous son as “Salvini Carioca” for his political closeness to the Italian politician. Mr Bolsonaro won in Sunday night’s run-off against the Socialist Fernando Haddad gaining 55 percent of the vote. Representing the right-wing Social Liberal Party (PSL) Bolsonaro, a former paratrooper, ran on a campaign of fighting corruption, getting tough on crime, and undoing the socialist policies of his predecessors — all pledges that resonated with the Brazilian people. The 63-year-old will take office on January first, and has pledged to govern “following the Bible and the constitution” and to defend “the constitution, democracy and freedom”. “We cannot continue flirting with socialism, communism, populism and the extremism of the left,” he added. In mid-October, Bolsonaro had pledged to extradite Cesare Battisti, a far-leftist Italian citizen wanted for four murders committed in the 1970s, a promise of particular import to the Italian government. Italy had repeatedly requested the extradition of Battisti, 63, who had been living in Brazil after being given protection by the country’s left-wing former president Luiz Inacio Lula da Silva, who is now serving a prison sentence for corruption. “I reaffirm my promise to extradite the terrorist Cesare Battisti, so loved by Brazil’s left, immediately in case of election victory,” Bolsonaro had said. Following on from congratulating Bolsonaro, Salvini added that “after years of chatter, I will ask that the red terrorist [Cesare Battisti] be sent back to Italy”. President Donald Trump also congratulated Mr Bolsonaro on Monday, saying that he “had a very good conversation with the newly elected President of Brazil, Jair Bolsonaro, who won his race by a substantial margin.